These two ponds are all that’s left over from the drying of the Maalbeek wetlands during the 19th century. While the area is very nice to be around, be warned that the water itself is heavily polluted. In fact, don’t even come close to it. Satisfy yourself with walking around the edges, admiring the surrounding architecture. Love this? Explore the entire list of places to visit in Brussels before you plan your trip. Fancy a good night's sleep after a tiring day? Check out where to stay in Brussels and book an accommodation of your choice. How popular is Ixelles Ponds? People normally club together St Gilles and Children's Museum while planning their visit to Ixelles Ponds. 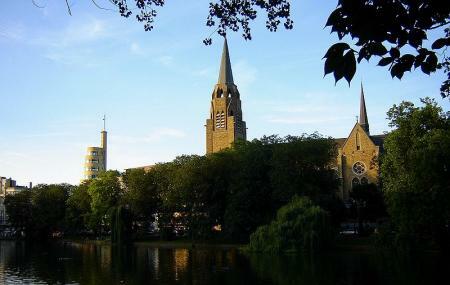 Un chouette point d'eau a Ixelles qui passe par les beaux-quartiers 'français' et fait la jonction entre le quartier estudiantin et la place Flagey, cœur vivant de la commune. Les deux étangs sont biens entretenus et ses bords sont bondés dès qu'il y a soleil! Bel endroit pour une promenade ou un jogging.